Symbol of Red Cross was registered in my mind all along since the days I can remember.Perhaps that logo still remains to be one of the most popular non commercial logos world wide to this day.As we all know, it is a generic sign for medical aid,health and hospital.It was in 1977 that I noticed a red crescent in lieu of red cross is also used for the purpose for the first time.It was while in Tripoli,Libya during a short stint in my career.I realized that Islamic countries use that logo instead of a cross, but thought of two different international organisations of the same nature. It took few more years for me to note that both logos are of the same organisation-International Red Cross and Red Crescent Organization(ICRC).While in Qatar it is always a Red Crescent like in all the Islamic countries but it is only ten years or so that I knew that there is yet another logo being used under ICRC banner - a Red Diamond!Surprisingly it was around the same time that I knew the red cross so represented did not have a religious intention originally though perceived as such very often!All the more, the wealthy person whose vision and dedication helped establish this great international body died a poor man in obscurity!! A wealthy philanthropic Swiss businessman named Jean Henri Durant happened to be in an Italian town of Solferno in 1859. That was when a 15 hours battle had just finished over there.Imperial Austria and the French on one side while Austrians on the other side.Among 320000 soldiers who fought 40000 died on the spot.Durant who was on his way to meet Napoleon III to discuss his business plans in Algeria,a colony of France then.He decided to drop his intended plans for some strange reasons and stayed back in the town.He organised the local people to attend the wounded on both sides.He was successful to make the town's old church into a makeshift hospital for the purpose. Eventually he returned to his native place-Geneva, Switzerland. 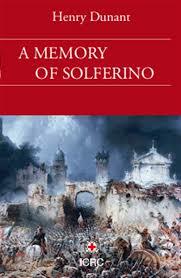 He continued to be obsessed with his experience at Solferno which culminated in writing a book titled 'A Memory Of Solferno'.Having published it in 1862, he set up a committee,himself as secretary, to promote the thought behind such a book - to form relief societies based on international principles to take care of the wounded in a war.The committee based the rules on those of Geneva convention. In 1863 an international conference was convened to formalize the decisions of the committee.Delegates from a dozen countries adapted the first Geneva convention and made it compulsory for armies to take care of the wounded soldiers irrespective of the sides they fight for.They adapted reverse of the Swiss flag as logo- a red cross on a white background.It represented neutrality just like Switzerland did.International Red Cross Organisation was thus born. During two years from 1876,war between Russia and Turkey took place.Turkey objected to using a Cross sign.Instead they used a Red Crescent for which Russia did not have any objection.In 1923 the Red Crescent was officially accepted by the Geneva Convention as an additional sign.Thereafter 33 Islamic countries use that sign. Israel never became a member of ICRC for six decades from its birth in 1950 because they objected to accept both the signs of a Cross or a Crescent.They formed Magen David Adom Society(MDA) for the purpose having a logo of Red Star of David which was their national symbol.Israel wanted to recognize the same logo to be a member of ICRC. Arab and Islamic countries objected to that proposal. Over the years,a number of other countries also had applied to ICRC to include their distinctive emblems recognized,India included. Authorities had to politely refuse all the requests for obvious reasons.After a series of deliberations ICRC decided to include a third logo which has a universal appeal, free of religious,ethnic or political connotations.A Red diamond was thus born in December 2005.Any member country can use that logo.Israel was permitted to use this logo along with the Star of David inserted, in their own country but in any other country ,it depends on the host country.Israel soon after joined the ICRC. I am sure that most of us do not know that the founder of Red Cross had very difficult years towards his last.By the end of 19th century his business which once thrived broke.He became a poor man.Durant whose vision had helped to establish the ICRC, which spent millions of dollars on medical and other aids world wide became a poor man. !His circumstances forced him to leave ICRC and Geneva to a hardly known Swiss mountain village and live in obscurity!Thankfully in 1901 he was awarded with the first Nobel prize for Peace.He died in 1910.Life is like that! !